The HERD” is celebrating its 23rd season of parade competition in 2011. Throughout its existence, the band has prided itself on its positive approach to competition in the marching arts. The students work hard, enjoy each other’s company, perform as well as they can, and appreciate the efforts and accomplishments of competitors from other schools. More than anything, members of “The HERD” are marching band fans who believe that their participation helps to develop essential skills found in well rounded young adults. “The HERD” has performed in many cities in Minnesota and Wisconsin, as well as Washington, D.C., Massachusetts, Maryland, Rhode Island, Michigan, Missouri, Alberta, and Quebec. In 2007 the band traveled to Rapid City, South Dakota and Greeley, Colorado. 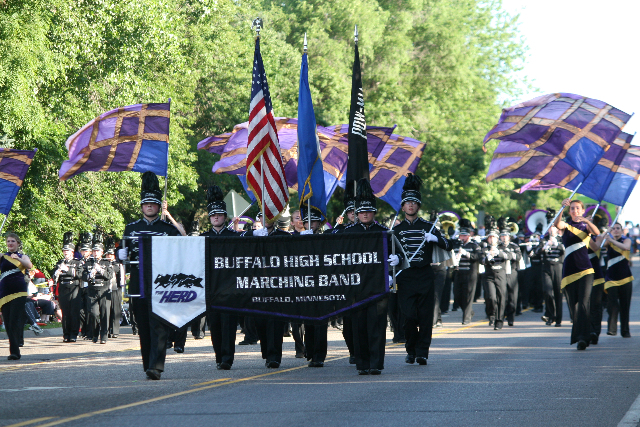 In 2009, “The HERD” participated in 10 parades in Minnesota, beginning and ending with hometown parades in Buffalo and Montrose. In July, “The HERD” traveled to Traverse City, Michigan to participate in the National Cherry Festival parades. In addition to marching band, Buffalo High School has 230 musicians performing in four concert bands, three jazz ensembles, a winter drumline and an extensive chamber music program. The HERD Winter Drumline was formed for two purposes. First, students get the opportunity to learn or enhance their marching and percussion skills that they use in the summer marching band program. Second, it’s a great activity that is a lot of fun! The HERD Winter Drumline began as a club with close ties to the high school music program and, for a time, was a school-sanctioned activity. With recent budget challenges in the school district, funding for Winter Drumline was cut, but it’s not gone. The HERD Winter Drumline continues this season as a club with a close tie to the schools music department. Being a club means we need parents to step up to make each season happen. Areas that will need volunteer help include floor & props, drivers, show chaperons, Home Show prep, uniforms, and advertising. The season will begin in mid-to-late September and usually finishes up in April. Keep watching the website for updates on Drumline. Opportunities exist all season long for parents to get involved to whatever level they choose and to make the Winter Drumline experience a positive one for all the students involved. Students are not required to have been involved with music before, they only need to be ready to learn and have fun. This web site is maintained and operated at no expense to the Buffalo-Hanover-Montrose school district.